This is the first recipie post brought to you in partnership with Leah from Love Me Feed Me. This fellow C anadian down to earth girl created her website with a goal to inspire and share scrumptious healthy plant based recipes with anyone and everyone. Dreams of pursuing a career that allows her to help and/or feed people and of one day being as fabulous as Miss Piggy. Never takes herself too seriously. Currently on an ongoing search for balance, self-acceptance, and happiness. Falafel is Middle Eastern food gone mainstream, and for good reason. Crispy, spicy, and packed with enough protein (from the chickpeas) to keep you full, it’s no wonder it has become one of the most popular fast foods. Especially when wedged between warm toasted pita bread and drizzled with tzatziki, falafel simply can do no wrong. Or can it? When it comes to nutrition, a lot of what falafel inherently offers—plant-based protein, fiber, and a dose of veggies—is compromised during the frying process. This recipe from Love Me Feed Me keeps true to falafel’s promise of fragrant herbs, hit-the-spot spices, and hearty chickpeas, but using a healthier cooking method—baking. 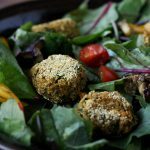 For a light and satisfying dinner meal, try eliminating the pita pocket, and serve the falafels on a simple, crisp salad of earthy kale,fresh spinach, sweet peppers, and cherry tomatoes, all topped with a spicy tahini dressing. In under an hour you can prepare a batch of twenty falafels that will last all week, and leftovers are perfect for weekday lunches. In a food processor or blender, blend the parsley, onion, and garlic to a paste. Add 1 cup of the chickpeas and the spices and blend until smooth. Add the rest of the chickpeas and pulse, leaving some bits and pieces of chickpeas for texture. Transfer to a mixing bowl and stir in the chickpea flour. Taste and adjust seasonings if needed. Spread some cornmeal out on a plate. Use a tablespoon to scoop the falafel mixture then roll into a ball, roll the falafel in the cornmeal, and then transfer to parchment lined baking tray. Slightly press down on the tops of the falafel to flatten a bit. Continue this process with the rest of the mixture. Bake for 20-25 minutes or until golden - flipping halfway through. For the tahini sauce simply mix all ingredients. 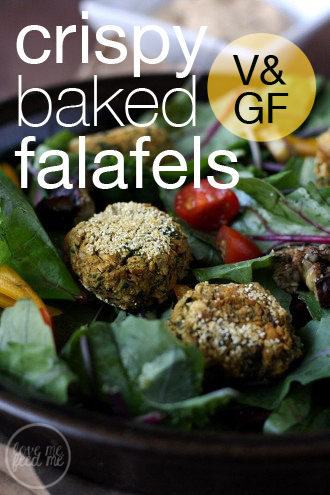 Serve falafels with the spicy tahini sauce, hummus, and veggies or stuffed in a pita! Will keep in the fridge in an airtight container for up to a week. You can eat the falafel like that or put them in a pan with a little oil for re-heating or pop them back in the oven when you need them. They freeze very well, so you will have a nice stash of homemade falafel in your freezer, which is super convenient.